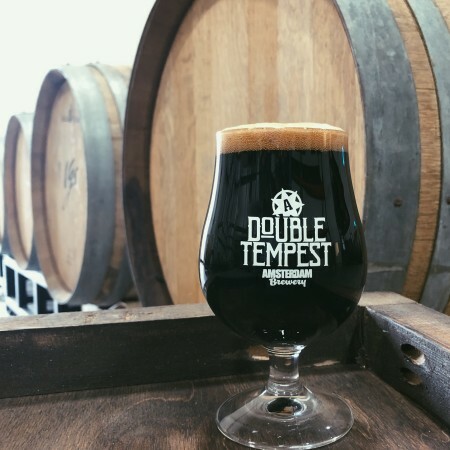 TORONTO, ON – Amsterdam Brewery has announced release details for the 2018 vintage of Double Tempest Barrel-Aged Imperial Stout. The 6th annual edition of the multiple award winning beer has been aged in Woodford Reserve Double Oak bourbon barrels, and will be released on Saturday November 17th at 11:00 AM in the retail stores at the main Amsterdam Brewery (45 Esandar Drive) and the Amsterdam Brewhouse (245 Queens Quay West). A free admission release party will take place at Amsterdam Brewhouse that day featuring Double Tempest and other new and rare beers on tap, food pairings, and more. A ticketed preview event will be happening at Amsterdam Barrel House (87 Laird Drive) on Friday November 16th at 7:00 PM, featuring an exclusive taplist, paired hors d’oeuvres, a guided tasting, and a take-home gift pack with a bottle of this year’s Double Tempest.